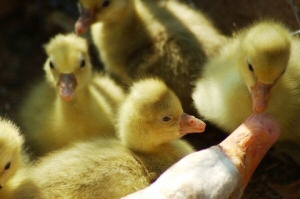 I was born in a hatchery along with scores of other goslings one sunny April day. I had never met my mother. My sisters and all the other girls born that day met their deaths within an hour of hatching... dropped through a huge funnel onto slicing blades that crushed their tiny bodies while still alive, to end up in some kind of animal feed. Being a boy my life was spared, which some might think makes me one of the lucky ones. I don't agree. Though the sun was shining that day I was never to see it or feel the warmth on my feathers, I was only ever going to know darkness, pain and misery. Within days of my birth I was sent to a farm, a filthy sprawling place hidden away in the countryside. I was raised here for four weeks, in a crowded windowless shed. There were so many other goslings in there with me that I could barely move. We huddled together to comfort ourselves because we didn't know what was happening to us but it was frightening to be so squashed and a lot of the smaller babies got trampled on, some even suffocated. The floor was thick with excrement and the stench was unbelivevable. Though we are naturally water birds there was barely a trickle of water between us so there was no way to clean our feathers. I ate and ate and I grew quickly. The next experience I can remember is the day I was sent to the cages. This was to be my home... a wire cage in another dark shed with nine other geese. No natural light, no fresh air, no water to bathe in and I couldn't even stretch my wings. It was pure torture. I was desperate to move but however much I tried to I just got more squashed by the other geese. We all felt panicked by the claustrophobia. Before long the wire floor of the cage was cutting into my webbed feet and my eyes were watering from the burning fumes of ammonia. We were fed and fed, a high-protein, high-starch diet to make us grow as quickly as possible. I could barely stand and my feathers began falling out as they constantly chafed against the rough sides of the cage. I had open sores too, that burned from the excrement and urine that surrounded us. It was a living hell that I couldn't escape from and worst of all was the fact there was no water to bathe in, something I desperatey craved. I thought things couldn't get any worse but I was wrong. When I was ten weeks old the true horror began. A steely eyed farm worker suddenly descended upon us and I was grabbed by my neck and my head dragged through an opening at the front of the cage. I was terrified as he forced open my beak and thrust a huge metal pipe down my throat. The pain was unbearable but I couldn't move to get away - then the most hideous thing happened, a massive gush of feed began to pump down the tube, filling my oesophagus to the point I thought I was going to burst. It didn't stop until a pound of grain had been forced into me and afterwards I lay spent, vomit around my beak as I listened to the same thing happening to my friends all around me. This ordeal would happen three times a day and each time a pound of feed was forcibly packed into my oesophagus, making me heave painfully. I came to dread the sound of footsteps coming towards the shed but I lay helpless with my head hanging, alone in my silent nightmare, unable to move as my body was so heavy. Some of the other birds had broken beaks and open lacerations on their necks from the rough handing. The workers were so violent in the way they handled us, grabbing us by our already excruciatingly painful necks and ramming the pipe down our throats past tumours that had grown, sometimes totally rupturing the flesh from the inside. This happened to one of my fellow captives and he bled to death on the floor of the cage. Nobody even bothered to remove his body and the rats feasted on him. The force-feeding went on for three long weeks, I could never have imagined such horror. I was raw with open wounds on my body by this time and covered in my own vomit, faeces and blood. So weak and ill I couldn't lift my own head any longer. I didn't know it but my liver had now swollen to 10 times its normal size, something that would later be eaten as a delicacy by humans and called "foie gras". I now realise that I was not an individual, my life was only ever going to be exploited... all I am is a victim of the foie-gras industry. 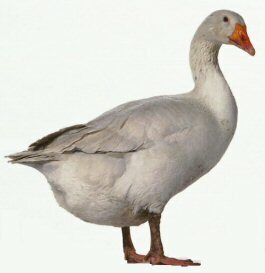 Geese are very loyal to their families-they mate for life and are very protective of their partners and offspring. If a goose's mate or chicks become sick or injured, she will often refuse to leave their side, even if winter is approaching and the other geese in her group are flying south. Those who have spent time observing geese report that they experience emotions just as we do-when a goose's mate is killed or her eggs are destroyed, she will seclude herself from other geese while she mourns. After a partner dies, some geese spend the rest of their lives as widows, refusing to mate again-this can be a long time, because geese live up to 25 years. While we ourselves are the living graves of murdered beasts, how can we expect any ideal conditions on this earth?